It is best to have your diamond removed from its setting and loose before having it graded, appraised, or evaluated by a diamond buyer. Loose diamonds are diamonds that are not set in a ring, mounting, or jewelry finding. Diamonds should be loose when graded. If the diamond is mounted, a buyer or appraiser can only make an estimation of the carat weight, color, and clarity. Mounted diamonds could have damage (i.e. chip or nicks) under prongs or metal covering the diamonds. If a diamond is “bezel set” (i.e. the diamond is secured in the mounting by a thin strip of metal surrounding the stone’s perimeter), the diamond grader cannot see the diamond’s girdle of edge to the diamond to look for nicks and possible chipping. 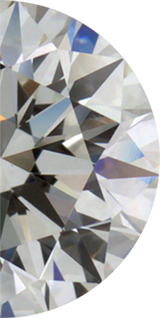 Damage to a diamond can affect the clarity grade and its value. Color grading loose diamonds is preferred as they can be viewed under controlled conditions using a white background and color grading lamp with white light. Assessing the true diamond color is limited while set in a ring. Diamonds mounted in yellow gold often reflect the gold tones of the metal which can throw off any appraiser or diamond grader. Estimating the actual hue or color grade of the diamond cannot be done well if not loose. Diamond graders prefer to set the loose diamond next to master stones or “master set” (i.e. pre-graded set of color graded diamonds) to determine color. Set diamonds are very difficult to measure accurately and apply diamond weight estimation formulas. Many styles of diamond rings do not allow for measuring a diamond with a leverage gauge. Mounting and ring can interfere with assessing a diamond’s polish and symmetry as the metal can block a grader from viewing facet junctures or other facets to make a grading decision. Please contact us if you need advice on how to remove your diamond from its setting. We can arrange to have your diamond removed from its setting upon request.